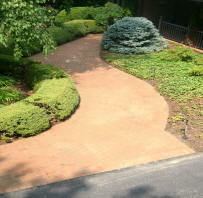 Pavers before, during and after the pressure washing with steam. 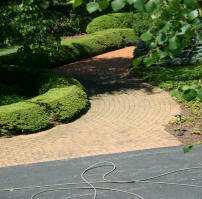 The (close-up of cleaning) picture shows how deep we clean between the pavers. 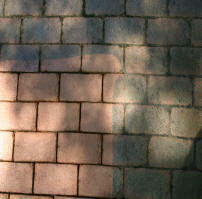 The (dryer close-up) shows the depth of cleaning and the transition of color. 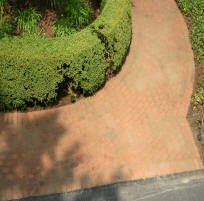 The (pavers half cleaned) picture also shows the transition of color. The (first day wet with sand) picture shows you what to expect when we are done. The (close-up half done) picture really shows up close how clean and dirty it really is. The (three days after sand is installed) shows you what to expect for about a week or so. 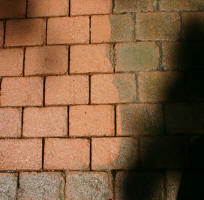 Click on any picture to enlarge it and see close up the details on what we offer with the cleaning and why you should have us for the maintaining of your pavers. Three days after sand is installed. First day, wet with sand. 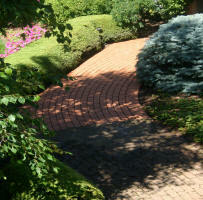 We can stop your pavers from walking away!